If you’re planning to spend a relaxing day at the beach, make the most of the day by bringing along a beach tent. These handy shelters provide protection from the beating sun, which can keep you cool on especially hot days or shield you from UV rays when your sunscreen isn’t enough to prevent a burn. Beach tents can also make a windy day at the beach much more enjoyable – instead of having sand blowing into your eyes, you can relax inside the shelter and take in the expansive ocean views. Best of all, having a tent on the beach creates a central point for you to store your stuff without fear of it blowing away if you decide to go for a dip in the ocean. Of course, before picking a you’ll want to find the best beach tent for you – which is why we’ve reviewed the 8 best beach tents for your next day at the shore. Before jumping into the reviews, it’s important to know what features to look for in a beach tent. These tents range from lightweight canopies to heavy-duty shelters, and offer a myriad of accessory options. The most important considerations are ease of setup and stability. If the shelter is hard to pitch or blows away at the first coastal breeze, your day can go from relaxing to anxiety-inducing. All of the beach tents reviewed here are quick to set up and won’t budge easily. Whether a beach tent is breathable is also critical, since hot days can quickly turn some otherwise great tents into ovens. This is where differences in tent design, including the number and size of windows, can be extremely important. Depending on how many people you plan on bringing to the beach with you, the size of the tent can also be a factor in deciding on the right shelter. Beach tents also offer a variety of features that come down to personal preferences. Some tents are mostly open to the beach with few walls, whereas others are primarily enclosed with only a few windows. If you expect to use your tent as a changing room on the beach, it is important to choose a shelter that can be fully closed off for privacy. If you don’t mind the sand, you may opt for a lighter tent that lacks a floor, whereas for those trying not to get covered in sand may want a tent that features an extended floor. Finally, interior pockets can be critical for those prone to losing their sunscreen in the tangle of beach gear. With all these guidelines in mind, here are our 8 favorite beach tents. The Coleman Road Trip Beach Shade is one of the all-around best tents for any day at the beach. The tent design features a front and rear door, both of which can be fully closed to use the tent as a changing room. Fully opened, they include screens to let the breeze in without getting bugs in the tent. Compared to more minimalist shelters, the enclosed design of the Beach Shade also means that you don’t need to reposition the tent as the sun moves throughout the day – it will stay shady inside! In addition, the included floor extends all the way to the front of the shelter, creating a porch to lay down on if you want to soak in some sun without getting covered in sand. Although the stakes included with the tent are relatively short, they do an excellent job of stabilizing the tent and the shelter comes with sandbags that can be weigh down the tent on windy days when no one is inside. The only drawback to this tent is that it doesn’t have side windows or roof vents, so on particularly hot and windless days it can get warm inside. The Pacific Breeze Deluxe XL is, as its name suggests, extra large – the roomy interior provides enough space for up to four people to fit comfortably. It’s also a cinch to set up thanks to the simple pop-up hub design on the roof. It takes less than two minutes to go from carrying case to upright, meaning that your group won’t be impatiently waiting for the tent to be open for relaxing. And rather than sand stakes, the tent includes pockets for sandbags to weigh it down and is stable even in strong winds. The Deluxe XL is enclosed on three sides, giving you all-day shade without moving the tent. It also features large windows on each of those walls to promote plenty of air flow, even on very hot days. 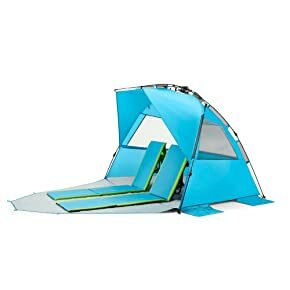 The floor keeps your group off of the sand, but only extends to the edge of the tent rather than beyond in a porch configuration so you will want some towels to lay on if you decide to get some sun. The Saratoga Outdoor Instant Beach Tent is as light and easy as it gets for tent-style beach shelters. Similar to the Pacific Breeze Deluxe XL, this tent features a pop-up hub that enables it to be setup in seconds and uses sandbags, rather than stakes, to anchor it in place. Shaped like a half-dome, this tent is not designed to be a fully enclosed shelter. That means that it provides excellent shade when the sun is behind you, but may have to be turned once during the day to move with the sun. The upside, though, is that with its open face and two rear screen windows, it has no problem with air flow and won’t heat up even on blazingly hot days. The tent floor can also be extended into a porch, giving the tent significantly more lounging room. An added bonus is the large mesh interior pocket, which can hold everything from sunscreen to towels to water bottles. The Easthills Outdoors Easy Up Beach Tent is designed for two people, but has room for three or four. The tall ceiling means that beach chairs can easily fit inside the tent, so you don’t need to choose between staying in the shade and sitting comfortably. The walls have four mesh pockets to store small items, so that your sunscreen and phone are never out of reach. 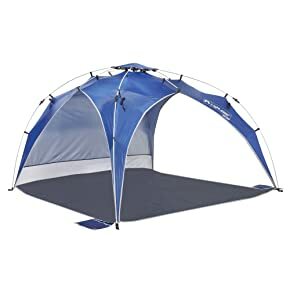 This tent also features an extended floor in a porch configuration, in case you would rather lie down in the sun for a while. Unlike many other tents that feature a porch, this one can be zipped closed to use the tent as a changing room as well. The tent also features three large screen windows, which can be closed when changing in the tent, to promote air flow. However, because of the roomy, enclosed design of the tent it can get warm on hot and sunny days. While the tent sets up in under a minute using a pop-up hub system, only stakes and guylines are included rather than sandbags – so plan to spend an extra few minutes securing the tent in place. The Sport-Brella Sun Umbrella takes the idea of a traditional beach umbrella and flips it on its side – literally. Similar to a tent, the Sport-Brella provides a semi-enclosed shelter but utilizes a spiked pole in the center to anchor it into the ground, along with stake points around the rim of the shelter. There are several advantages to this design. First, it takes seconds to set up. Simply open the umbrella, spike it into the ground, and throw down a few stakes. Second, and more important, it has excellent ventilation even on extremely hot days. This is in large part due to the roof vents at the apex of the umbrella, which few other beach tents feature. It also has two large side windows to help funnel air through the shelter. 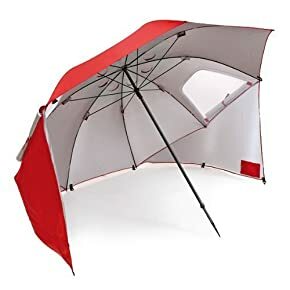 The downsides to the Sport-Brella design is that it has a large pole in the center, which you need to lay out your things around, and that is lacks a floor to keep you off the sand. Beach tents don’t get any easier to set up than the OutdoorsmanLab Pop Up Beach Tent. Like a laundry hamper, the tent simply springs into shape when you open its included carrying case. Stake in the corners, and you’re ready to start enjoying your day at the beach. The tent can be difficult to properly pack up into the carrying case at first, but online videos show the best way to do it and it comes easily after trying it a few times. Plan to try this out at home before taking it to the beach for the first time, since it’s easier to struggle in your living room than in the sand and wind. The shelter itself has plenty of room for two people and features a floor that can be extended out into a porch. 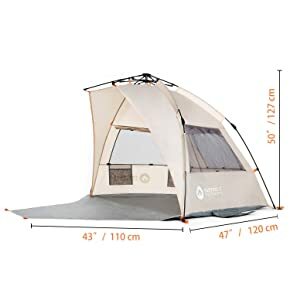 Although the rear wall includes a large window for ventilation, the lack of windows on the side wall means that the tent can accumulate heat. What sets the EasyGo Instant Beach Shelter apart from its competitors is that it doesn’t have a single zipper. That doesn’t mean it lacks features – it has three roll-up windows and a large front flap that can be closed for privacy or extended into a front porch. Instead, the tent uses hook-and-loop closures throughout the design. 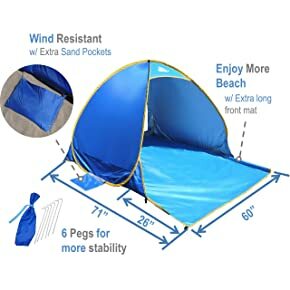 This is a huge plus for the tent’s durability, since metal zippers have a tendency to rust and break after several seasons’ exposure to salty, humid beach conditions. The tent material and poles are also constructed from durable materials, so that you won’t have to replace this tent for many years. 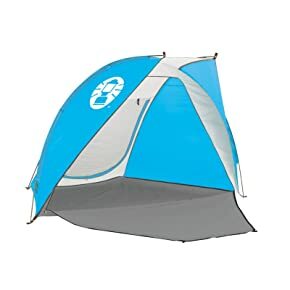 Another great feature is that this tent is easy to set up, using a pop-up hub system and featuring built-in sandbag pockets around the outside of the tent. 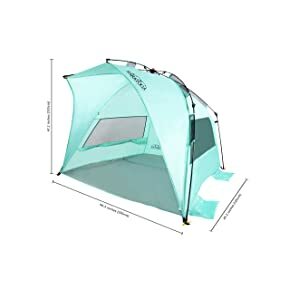 The only downside to this tent is that even with the three windows, ventilation can be a challenge on sunny, windless days meaning that the interior can heat up rapidly. Forget trying to add more or bigger windows to create ventilation – the Lightspeed Outdoors Quick Canopy simply gets rid of the walls altogether. This tent takes the shape of a traditional dome beach tent, but cuts away nearly all of the front and side walls to leave only a rear panel for shade. The dome shape means that you’ll still be protected when the sun is directly overhead as well, although you may need to turn the tent once during the day to move with the sun. The pop-up hub design makes this tent extremely easy to set up, and because there is only one wall to catch the wind the built-in sandbags and included corner stakes are plenty to keep this tent from budging even in severe gusts. Plenty of mesh pockets in the interior are an added bonus for this tent as well. 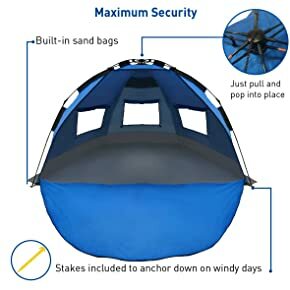 The only downside to the open design is that this tent will do very little to protect you and your stuff from rain in the event that a storm blows through during your beach day. Many beach tents do a fine job of protecting you from the sun, but these eight stand out from the crowd for their ease of setup, stability in the wind, ventilation, and added features. Any of them will make a great shelter for your next day at the beach, and the choice really comes down to your personal preferences about the design that works best you and your group. Now that you have the information you need to pick the best beach tent for you, it’s time to get out to the shore and enjoy!